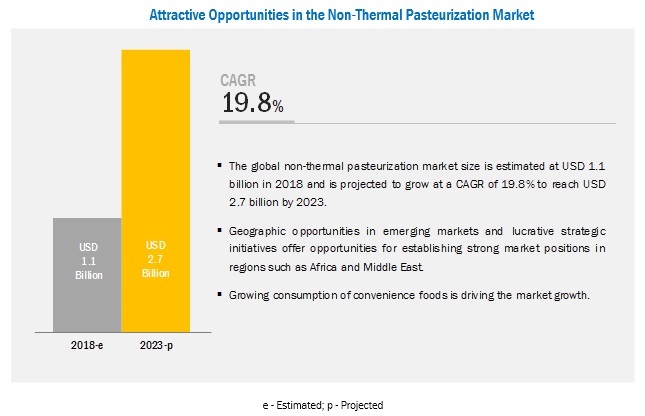 [150 Pages Report] The non-thermal pasteurization market is estimated to account for about USD 1.1 billion in 2018 and is projected to reach a value of about USD 2.7 billion by 2023, at a CAGR of 19.8%. The growth of the convenience food sector, which includes products such as frozen foods and ready-to-eat foods, has increased the demand for non-thermal pasteurization, as these technologies reduce the processing time and increase the production capacity to meet the growing market demand. However, high capital investment is hampering non-thermal pasteurization market growth. By technique, the PEF segment is estimated to grow at the highest CAGR in the next five years. This technology preserves the freshness of food products as well as aids in extending their shelf life. It also accommodates consumer demand for natural, fresh, and minimally processed foods, as no preservatives or additives are added to products. Although PEF is new compared to HPP, it has been accepted globally by the processed potato industry. Due to these factors, the market is projected to grow at a significant rate in the future. By application, the beverages segment is estimated to grow at the highest CAGR during the forecast period. Non-thermal processes such as PEF and HPP are increasingly preferred in the beverage industry, as they effectively increase the shelf life of beverages and prevent microbial development. Additionally, colors, flavors, and nutrients can be efficiently preserved with the help of this technology. This technology helps in preserving nutrient, color, and flavor in products; and also enables gentle preservation of beverages at ambient temperature. Thus, these factors are expected to fuel the market growth. By food form, the solid segment is estimated to have a larger market share in the forecast period. This is due to the usage of non-thermal pasteurization techniques in food products such as cheese, jellies, jam, processed food, meat products, etc. However, various technologies such as HPP and PEF are used to enhance the extraction of several bioactive components and sugars to preserve the food for a longer period of time. The growth of the North America non-thermal pasteurization market is attributed to the increasing awareness among food product manufacturers about the importance of non-thermal pasteurization. Further, with rapid economic growth in the region, the demand for meat is rising particularly in China, India, Japan, and Australia. This increased demand for meat products has driven meat production in this region, which, in turn, has contributed to the market growth. Changing busy lifestyle of consumers and rising health awareness are also factors that are driving the market growth. The key players in this market include Hiperbaric Espana (SPAIN), Avure Technologies (US), Thyssenkrupp AG (Germany), Kobe Steel Ltd (Japan), Bosch (Germany), Chic Freshertech (US), Elea Technology (Germany), Pulsemaster (Netherlands), Nordion (Canada), Multivac Sepp Haggenmuller SE & CO. KG (Germany), Stansted Fluid Powder Ltd (UK), Symbios Technologies (US), Dukane Corporation (US), Gray*star (US), and Universal Pure (US). These players are focusing on improving their presence by undertaking expansions and developing products specific to the requirements of consumers and their preferences in these regions. These companies have a strong presence in Europe and North America. Also, they have set up manufacturing facilities in various regions, and have strong distribution networks. In February 2018, Mhenviron Group (Canada), Minh Hýng Group (Vietnam) And Avure Technologies signed a MoU to build a high-pressure processing technology food processing plant in Vietnam. In January 2018, Bosch launched an innovative ultrasonic cutting technology for easier enrobing and packaging of food products. This new technology exposes the products to minimal stress and pressure, securing their quality. In June 2018, Multivac opened a new production facility in Bulgaria to increase its production capacity. In September 2017, HIPERBARIC ESPAÑA launched Hiperbaric 1050 bulk, a new HPP equipment, for the beverage industry. In October 2017, Avure Technologies launched a scalable HPP machine-AV-M. It is featured with easy upgradation from 20M to 30M to 40M and increases the capacity up to 180%. What are the new trending technologies that non-thermal pasteurization companies are exploring? What are the upcoming growth trends that non-thermal pasteurization manufacturers are focusing on in the future? 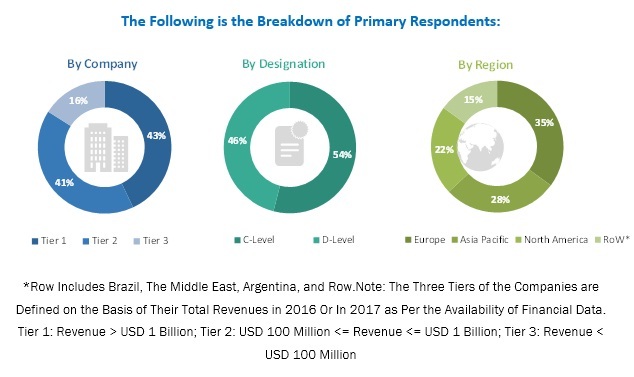 What are the high-growth opportunities in the non-thermal pasteurization market in each segment? What are the key growth strategies adopted by major market players in the non-thermal pasteurization market? 9.3.1 HPP is Totally Inclined With the Requirements of All Food Types. 10.4.2.1 India is One of the Fastest-Growing Markets for Food Packaging Technology & Equipment. The study involves four major activities to estimate the current market size for non-thermal pasteurization. Exhaustive secondary research was done to collect information on the market, the peer market, and the parent market. These findings, assumptions, and market size was validated with industry experts across the value chain through primary research. Both the top-down and bottom-up approaches were employed to estimate the complete market size. Thereafter, the market breakdown and data triangulation were used to estimate the market size of segments and subsegments. 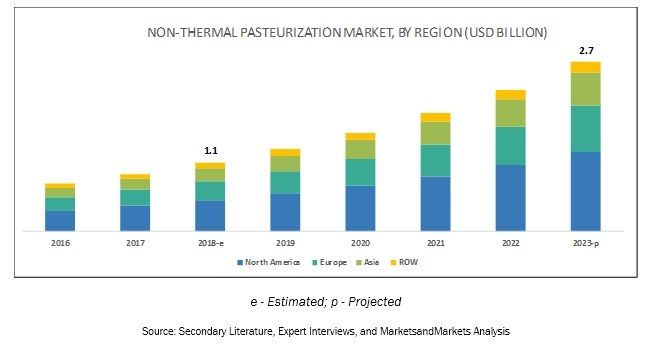 The value chain and market size of the non-thermal pasteurization market, in terms of value, were determined through primary and secondary research. The research included the study of reports, reviews, and newsletters of top market players, along with extensive interviews for key opinions from leaders, such as CEOs, directors, and marketing executives. Hiperbaric Espana (Spain), Avure Technologies (US), Thyssenkrupp AG (Germany), Kobe Steel Ltd (Japan), and BOSCH (Germany). This research report categorizes the non-thermal pasteurization market based on technique, application, food form, and region.